Terry Cavanagh's challenging game of gravity flipping is making its way to Vita. We wouldn't blame you for assuming that Sony, after its indie heavy Gamescom conference, might have run out of independently developed games to announce for PlayStation platforms. Apparently however, the indie wellspring never runs dry, because the company is using the ongoing events at PAX as an opportunity to reveal even more titles heading to its hardware. The Vita, for instance, will soon be privy to a treat in the form VVVVVV, Terry Cavanagh's gravity-centric puzzle game. If you haven't heard of VVVVVV, originally launched on PC and then ported to 3DS, it centers on one Captain Veridian and his crew who have become trapped in an alternate dimension. The player's goal is to find the crew "and maybe save the dimension." 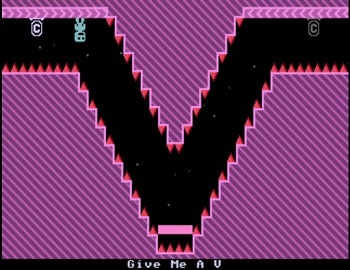 The real focus of VVVVVV, however, is its gameplay. While the game looks like your standard platformer at first glance, it comes with a twist. There's no jump button in the game. Rather, players can control a switch that reverses the flow of gravity. Using the switch will cause the player to ascend or descend depending on where they're standing and can lead to funky things like walking on the ceiling. As fun as that may sound you can probably count on dying quite a bit in VVVVVV. It's one of those platforming titles that takes pleasure in repeatedly murdering you. That said, it also provides frequent checkpoints to keep the experience from becoming too frustrating. No release date or pricing information for the Vita version have been released yet. That said, we'll be looking forward to defying gravity with VVVVVV when it makes its Vita debut.